Thank you everyone for stopping by and the lovely feedback on our stint on BBC 2. So the Olympics have come and gone and all in a whirlwind. Due to issues beyond our control (AKA the Ghost Town that was London over the last two week) we pulled out of the Newham Like Site but we will be taking our Chaat and Dosa to Newham soon (see details). We made the best of the situation and got a chance to try lots of new traders and soak in the atmosphere of the city. Great times at Exhibition Road, Eat.St and StreetFeastLDN ensured that we were kept busy. This week also saw the start of the new Lorraine Pascale series ‘Fast Fresh and Easy’. We did some filming with Lorraine recently and are looking forward to see it on BBC2 soon. Among all the horror stories going around about what to expect in London over the Olympic period there is a rainbow among the gray clouds. HOP, with all its colours, will be popping up in several locations to bring you amazing Indian Street Food to brighten up your day. So grab a bhel puri cone while watching hockey or some pani puri in-between sets at tennis or even grab a dosa or samosa chaat before events. The start of these blog posts are starting to sound like the emails I send to friends back in Australia…’I know it has been long since my last email but things have been crazy busy’ Now that is out of the way let me set out some pics and details of what we have been up to. 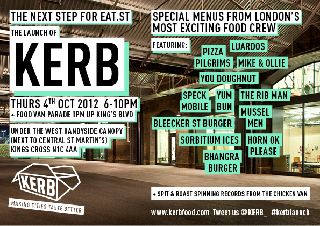 The most exciting news of late is that we are now part of the Eat.st collective of street food traders. With them have started trading on Monday at King’s Cross. Feedback has been excellent and in the two weeks we have traded there we have picked up a whole lot of new Indian Street Food converts. 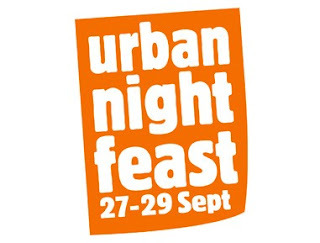 Early summer nights have also seen us at two night markets…StockMKT in Bermondsey and StreetFeastLDN in Brick Lane. This is a 12 week event and we will be there for 5 more weeks after the Jubilee Weekend. Two weeknds in April saw us pitch up at Southbank behind the Royal Festival Hall for the ‘Taste of India’ Festival in conjunction with events happening at the Festival Hall. This was organised by the people behind the RealFoodFest. It was nice to stand out from the crowd of traders who were presenting the usual curry, rice and naan. Moong Dhal dosa and Samosa Chaat were a hit and toward the end of each day it was all about pani puri and bhel puri – was like being back on the streets of India. 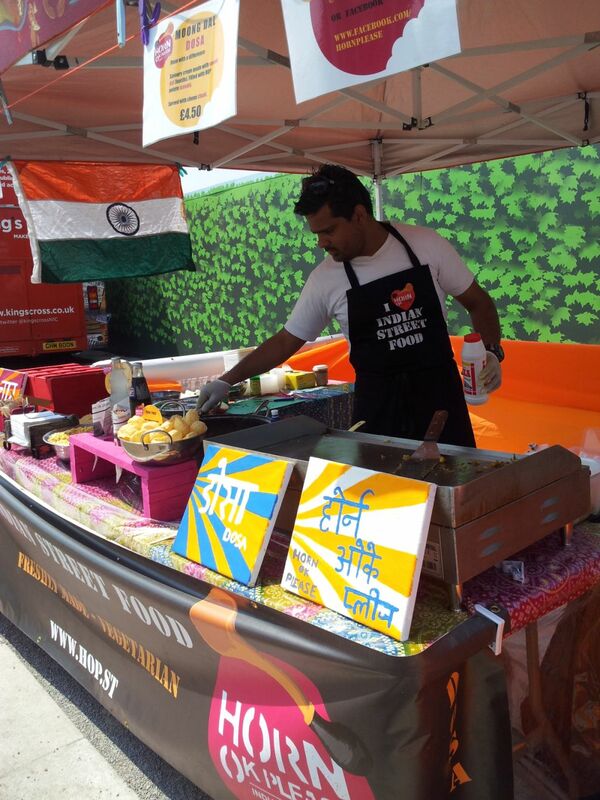 As a first the organisers also asked if we can do a demo on street food…my first but I think it went well. Video of the first weekend. At Taste of India we met some great people. One of which lead to our first canapé event held in May for an art exhibition ‘Hope Amongst the Ruins’ showcasing stills from movie by Deepak Verma (of EastEnders fame) called Mumbai Charlie. The money raised was going to charity so HOP was happy to help out. Mini Bhel Puri, Aloo tikki, and pani puris were all served to a very receptive crowd. We look forward to working with Deepak on future events. We have also been at Brick Lane on our weekends off and where possible at Surrey Street in Croydon. Make sure you don’t miss out on visiting our stall and sampling what everyone is talking about.